It's insanely delicious puree, it can be used as a filling in pies or pancakes, and even as a layer in cakes. The recipe is by Valentina from site «Cook at home». Use not hard apples for this puree. Wash apples, drain the water, then peel them and remove cord, cut in 4 parts, then cut in pieces. Pour water in the saucepan, in which you will boil (it is desirable to take a pot with a thick bottom not ot burn puree), spread apples, cover with lid and boil over a low heat till apples become soft (in about 30 min). Then turn off the heat and mash apples into puree well, you can use hand blender, I mashed with pouder. Next pour in apple puree sugar, mix and bring to boil, pour condensed milk, stir it, bring to a boil and cook for 5 min stirring occasionally (watch not to burn a puree!). Next spread ready puree in sterilized jars and cork with boiled caps. Wrap in something warm and leave jars to cool. 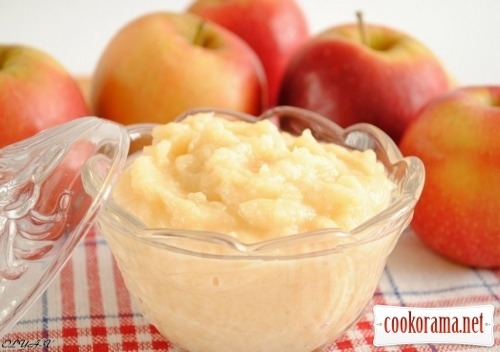 Top of recipe "Apple puree "tenderling""
Дуже смачно і як начинка цікаво. Recipes, Fruit canning, Apple puree "tenderling"